Stowe, indoor pool and hot tub on site. distance to swimming, golf and restaurants. Stowe (and the Theatre) are the place. it's hard to even make a list. our indoor pool - well, simply perfect! route - and yet it's pleasantly private. are going to love what we have to offer! 43" Home Theater system with State of the Art Surround Sound, huge screened in porch features wooded views for privacy and the ultimate in relaxation! Stowe is known as the Vacation Capital of the East for good reason. Our skiing is excellent - but that's just one season. Spring, summer and fall are also excellent times to stay in the Theatre in the Woods. There's always something to do - and relaxing is always one of the best choices! 52" HDTV and satelite system - your's to enjoy! Heated Indoor Swimming Pool with hot tub and sauna - great year round! 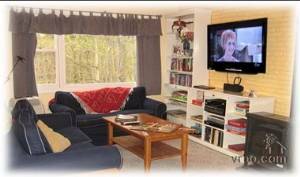 Relax and enjoy the screened in porch with it's view of the birches that surround the theatre. Coffe anyone? Designer decor makes our kitchen a perfect gem to work in. And we've supplied every appliance we could think of! So close to Mt. Mansfield (aka Stowe) you can touch it! Space for 8 - beautiful view - and so comfortable. 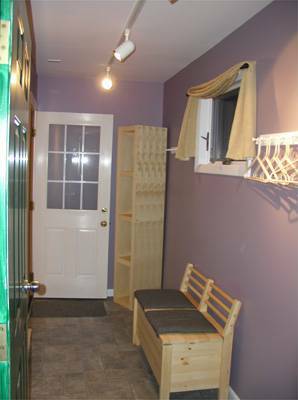 Cozy entry has room for 8 Snowboards and skis - not to mention boots, gloves etc. We highly appreciated our stay. Great place, clean with full services and even more. Great way to visit and enjoy Stowe's area. November 15, 2012 Reviewer: Jim From: Allen Park,Mich. was well equipped and very clean and spacious. the detailed instructions that were left. I loved the Theater in the Woods in Stowe Vt. I would definitely stay there again. It was so clean and I loved the kitchen and porch. 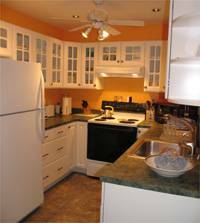 The staff was very helpful and the condo was well equiped with everything that you possibly need. I also loved the fact that the owner made up a book of all activities in the area and rated her favorite places. It was very enjoyable. celebrate our 50th wedding anniversary. The theatre is an awesome place to stay. to anyone looking for a great vacation. I do not recommend staying in the Theater In The Woods during the hot months of the summer. Daytime highs were in the upper 80's and low 90's during our stay in late July. We selected this unit because it advertised itself as having central A/C. While the condo claims to have central A/C it is not what I considered central A/C to be. The A/C unit is a large unit in the wall of the living room. This keeps the main living areas very comfortable but does not cool the bedrooms. There are no A/C vents in the bedrooms so when the doors are closed it gets warm. There are ceiling fans in 2 of the 3 bedrooms which help. The 3rd bedroom has no ceiling fan and only a single crank out window that opens onto the porch.. The 2 beds in that room are on a single elevated L- shaped platform with the twin mattresses touching at the base of the L. Make sure if those 2 twin mattresses are both occupied that the people don't mind touching one another. The kitchen sink/dishwasher have a funky hot water mechanism that requires you to push a button inside a door 5 minutes ahead of time if you want hot water. The signage about this is not readily noticeable and it took a day before we figured it out. We had trouble with the fire alarm in the master bedroom going off if we opened the bathroom door after taking a shower, even though we had the vent fan on. This happened 2 days in a row so we unplugged the smoke detector to stop it and reconnected it when we left. Not to sound all negative we loved the LARGE screened porch. This condo has the BEST lighting of any condo we have ever stayed in. You can read anywhere in any room. The kitchen is well supplied. The bedrooms do not have closets but do have dressers with drawers. The master bedroom has a small wardrobe where clothes can be hung up. It was very clean!! The other good qualities of the condo are mentioned in the other reviews. October 16, 2011 Reviewer: Anonymous From: Philadelphia, Pa.
spread out when you need to. Good location. Pleasant surroundings. We had a nice time. we had a great time here. The place is ideally located, pristinely clean, and very well laid out. I would defintely stay here again. We stayed at the Theatre in the Woods for 1 week in late August. We were 4 adults and 4 kids and we had a great time. 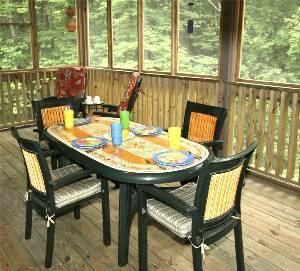 The children really enjoyed the screened in porch/deck and so did we; it let the adults sleep in as they played there. The kitchen was fully loaded, which, when feeding 8 people, was extremely appreciated. The pool was used daily, as it rained most of our time there. What a vacation saver that was! We also enjoyed many a movie on the wide screen tv nightly. All in all, we enjoyed our stay and will definitely return if we ever vacation in Stowe again. We loved our stay at "Theatre in the Woods". The condo was clean, cozy and had everything we could possibly need!My teenage children enjoyed the pool, basketball hoop and tennis courts. We would like to return some day. A very nice, clean condo with a great home entertainment center. Kitchen well-equipped. Me and five coworkers loved the condo. It is close to the MTN, and offers many of the amenities you will find in your own home, when i make it back to stowe this will def be my spot. Our family of four had a wonder time at the "Theatre in the Woods". The location was excellent being a short drive to both the mountain and the quaint village of Stowe. Some restaurants are within walking distance. The unit is well decorated and had all the comforts of home which made for a relaxing visit. Kids enjoyed the nearby pool - short walk away. Leslie is very helpful and will answer any questions you may have. We would certainly hope to return one day. We stayed here for 5 days and had an absolute blast. The chalet was very clean, had all of the modern amenities (including satellite, a big screen TV, wireless Internet and a great sound system), the owner was very friendly and quite attentive to our needs. Would definitely stay again! Our family LOVED our stay at Theater in The Woods!!! The unit was updated and very clean. The screened in porch with the porch swing was wonderful, especially on rainy days! The design of the unit is efficient in its use of space - the three bedrooms were great!. Everything that we needed was provided - nice towels, kitchenware, board games, books etc. The pool and hot tub at the resort were clean and very well maintained. Leslie is a pleasure to deal with and the owners obviously put a lot of love and care into this property. Theatre in the Woods was wonderful! Leslie was such a great host in offering dining recommendations and responding to every question! My husband loved watching sports on the big tv and my daughter loved having the Mac computer in "her" room. We came for skiing/snowboarding and loved it. Woke to fresh powder on Sunday-what a surprise for spring skiing. The kids enjoyed sledding right out back and we could watch from the porch. Nice to be able to walk to the hot tub and pool after a day on the slopes. Trails are nice and long at Mount Mansfield and enjoyed the restaurant at Spruce Peak-much better than just burgers and dogs! We enjoyed the restaurants we went to-The Shed, Pie in the Sky and Cactus Cafe(good pork enchiladas and ribs!). We had a great week here in Stowe, and the kids loved being at Theatre in the Woods. They even tobogganed right behind the condo in the woods. Chatham is very flat so this was quite the thrill. I loved how close we were to the rec path and the ski slopes are only 8 minutes away! My big find was Papa's Soup on Moscow road (very close to the condo) They have terrific homemade soups with all the fixings for a very reasonable price, and it really hits the spot after a day on the slopes. Their bakery looked good too and the people were so friendly (the grandkids call him Papa, hence the name of the store)Theatre in the Woods is much more reasonable than other accomodations in Stowe and is very well-equipped. We had a wonderful stay at theatre in the Woods. It was supplies with everything we could possibly want and was very cozy and clean. The only problem we had was regulating the heat so that we could make use of the gas fireplace. Homeowner Response: Glad your stay was wonderful. The trick to regulating the heat is simply not to over do it. Just bring the thermostat to about 20 C (65 F) and leave it alone during the day. At night, I love to bring it down to about 55 F - I sleep so well when my nose is a bit cold! It was joy to have stayed here, we would surely come back! The weather was wonderful. We rode the gondola up to Mt. Mansfield where we had lunch, and we hiked to the moss waterfall, and they were both just beautifully amazing. We found this place more relaxing than most places. We went to The Von Trapp Family Lodge, and ate there. Also we went to Ben and Jerry's factory, and learned how they make the ice cream. Last but not least we went to the University of Vermont, and the bear factory. We had a truly awesome week at Theatre in the Woods! We definitely would come back in a heartbeat. Stowe is a nice, quite town. It's laid-back atmosphere is very relaxing. Our family enjoyed walking the rec path (at least I made it from town out to the resort). We took part in mini golf, golf at the Country Club as well as shopping (of course). We also took the gondola ride and ate lunch at the Cliff House (awesome view!) and rode the alpine slide, along with the bungee jump. We took a trip to the teddy bear factory and also to Canada to the Granby Zoo (a must see!). Everyone enjoyed the tv, dvds and especially the porch. The family enjoyed the volleyball & open space for hitting some baseball around. Gracie's, the Sunset Grille & the Depot St. Malt Shop were our favorite food stops, however we didn't find one eatery we didn't like. The Von Trapp Tea Room for lunch was a fav too. The internet was a treat since my daughter & I needed to check in work email frequently (unfortunately). We look forward to coming back again soon, or even trying St. Croix?! All the best to the next vacationers staying at Theatre in the Woods! We stayed at Theatre in the Woods with friends last winter and it was perfect! Our best memories were made around the dinner table and laughing all night long in the family room. Very comfortable! We enjoyed our stay at Theatre in the Woods - we had the perfect ski conditions, enjoyed relaxing on comfy couches at the end of the day apres ski and made great use of the the hot tub. A great place for a ski family! The "Theater in the Woods" had everything that we needed for a comfortable family vacation. We especially enjoyed the feeling of being in a "treehouse" with the woods so close. The building was very quiet and the pool and tennis courts uncrowded. The compact three bedroom floor plan made good sense for our family of five. Leslie, the owner, was very attentive from start to finish. We made frequent use of the wireless internet with our own lap top. Overall, we had a wonderful experience in Stowe and the "Theater in the Woods". I had the great opportunity to stay at the theatre in the woods during the biggest snow fall of the last many years. It was simply magical and experience that I will not forget. The place is wonderful and better equipped than any place that I have stayed. I recommend it highly and will be back at the next possible opportunity.It is also great no matter what the time or season. We spent a week at the Theatre in the Woods in September - it felt like home immediately... so quiet and private, with beautiful views. Total comfort, all amenities; great theatre; easy access to terrific restaurants and shops - sightseeing is an absolute pleasure. The owner has added so many homey touches that are so welcoming. We SO look forward to staying again! Stayed at the Theater during the first week of October 2006 and had a great time. Very well equipped and in an excellent location. We are looking forward to visiting again. In spite of the fact that there was no snow for skiing we had a wonderful time. This positive experience is mainly due to the stay at this condo which was nice decorated, had a cozy fireplace and state of the art electronics! Highly recommended. What a great place and a great time. Best place we have rented in Stowe in Years. We felt like it was a home away from home. Can't wait to go back!!!!! We spent a lovely week at your condo and, although it was in the 90s the entire week, it was comfortable with all the ceiling fans. When we were "at home", we lived on the great deck. Morgan Horse Farm, Trapp Family Lodge and Fairbanks Museum from the Theatre in the Woods. Had a fantastic (and amusing) dinner at the Alpen Haus nearby. All the restaurants were great. Clean and simple. Big window looking into the upper reaches of trees above a small couch: a great place in which to read. Marvelous screened-in porch with a dining table and chairs. Great location, near river, bike trail, many shops, the mountains and notch. Leslie even located a piano for me to practice on during the week (local chuch was quite accomodating). Her review books, reporting on restaurants and such, seemed quite accurate and had our agreement, thus inspiring me to write this with gratitude. This rental is a great value and one gets the satisfaction of renting from one who seems to care a lot that you enjoy your time. the kitchen, movies, puzzles, and the porch! We'd love to come back! I’ve been to Stowe almost every year of my life since my 7th birthday, except for the previous 5. I have missed those years because I’ve had 9 reconstructive surgeries on my feet during this time and have been unable to climb the almost 40 stairs to my usual unit. This past year I was able to go because I stayed in the Theatre in the Woods (6 steps I think). I love Stowe so much if you look up the town it speaks for it’s self, the only and best way I can describe Theatre in the Woods is to say that being 24-years-old and being unable to walk for the past 5 and a half years, has made me feel as though I have lost those 5 and a half years. When I left the Theatre I actually cried because I knew I had gotten one week back. We traditionally spend our summer vacation at a house on the ocean and decided to try something different this year. We're glad we did. We have a family of 3 boys between the ages of 4 and 14 and everyone had a wonderful time. There was so much to do in Stowe - biking, mini-golfing, hiking, balloon festival, eating, Smuggler's notch, etc. 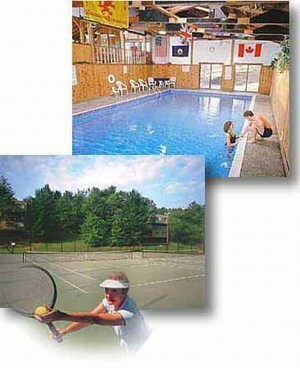 The big screen TV, tennis courts, and screened in porch were major bonuses to enjoy after the day's activities. Highly recommended! in Stowe, and this was the best ever! Theatre was a great hit! Thank you for opening this "home"
Great condo. Lot's of room. Everything you need for a comfortable stay. Very clean. Great closed in deck. Close to lots of good things. Beautiful area. Especially enjoyed the indoor swimming pool and the local area dining. treated your equipment as if it was ours! Thanks so much for everything. 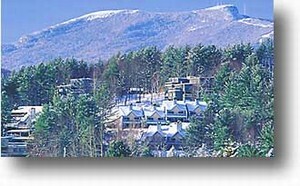 Stowe is fabulous and this condo/theatre in the woods made it a most pleasant time! The cozy comfort is wonderful! Thanks for sharing! her guests. The beds, bedding, lighting, color-scheme, kitchen, utensils, etc. And I forgot about the Theatre System!!!! condo - other owners could greatly benefit from what she has done here!! the Hill, the steeps and deeps were out of this world! Just returned to Manhattan after having stayed at Theatre in the Woods for 3 nights over MLK weekend...what an adorable condo! It is nicely furnished, with a fantastic surround-sound system and a gorgeous new kitchen that we really enjoyed cooking in! The pool area and hot tub are fantastic and great if you have kids (or are just a bunch of older kids like us!). The bedrooms are nicely decorated and the bathrooms are clean. The outdoor patio was so cute and would be fantastic in the summer. We really loved this condo, and hope to come back next winter! Thank you! kitchen well equiped. Thanks you for sharing your home with us. I give Theatre in The Woods 5 stars! 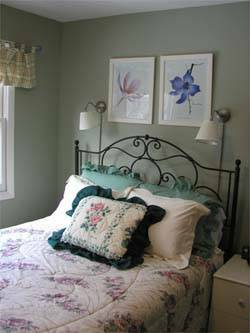 It is extremely comfortable and conveniently located on Cottage Club Road. It's a 1 minute walk to the hot tub and indoor pool, which is a nice way to unwind after a day of skiing/riding. The location is minutes from major highways so it is easy to travel to places like Burlington if you're interested in the night life. I have stayed at other condos in this area, and I would say that hands down Theatre in The Woods was situated 10 times better. There is also a great outdoor deck for having some tea/coffee in the morning and just enjoying the fresh breath of Vermont. I think the drive/shuttle to Stowe mountain took about 10 minutes, and I must add that Stowe had the best conditions on the entire east coast for Thanksgiving weekend. My only regret is that I could not stay there longer. My trip was to short to boast all of what the Theatre had to offer, I'm sure I missed a lot. The owner was also very good about communicating with me on either things to do or the actual accommodations. I had such a positive experience dealing with her and if you are in question about where to say--I GIVE THEATRE IN THE WOODS THE HIGHEST POSSIBLE RECOMMENDATION!!! We came to Stowe for a few days away and enjoyed our stay at the Theatre in the Woods. 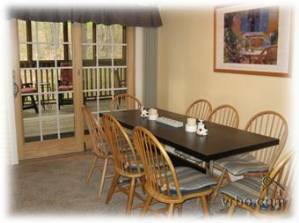 The condo is conveniently located, was very clean and held all the amenities that we were looking for. We have two small children and the condo was perfect for them. We'll certainly stay there again when visiting Vermont. We had a wonderful time at the Theatre in the Woods! The Theatre in the Woods was a perfect little get away for us - very quiet, well prepared for guests, in the heart of Stowe, not far from Burlington. We will be coming back for longer next year! The weather was a bit wet, but the condo was cozy and warm, and Vermont is a lovely state in any kind of weather. I loved staying here. this place is really nice. The deck, the TV, the DVD's, the computer - It's pretty cool. Oh and the pool is great too! Vermont is a wonderful place, I liked Stowe. We hiked, bought knives, did the slide, bought watches, did the Ben & Jerry's tour, went to an outdoor symphony, saw Smugglers Notch, saw waterfalls, swam, sat in the condo (the deck is great), slept, ate, and watched TV played games, did Trapp family lodge, even Lake Champlain Ferry. We really enjoyed our vacation at Theater in the Woods. This was our first visit to Vermont and it was awesome. So much too see and so much to do. We felt very much at home....you really make your place very comfortable. I have to say the porch was the best part of all for me. time-share or a condo for ourselves. Festival Show our last nite at Trapp Lodge. kitchen. big TV. Comfortable Deck. under the starts after the fireworks! Fav moments are too numberous to list! This place is very welcoming, it feels sort of like home. swimming, and ate at Pie in the Sky. Jerry's, Glass Blowign, and the Cider Mill. We had a lovely time in the Theater in the Woods! Very clean and comfortable and we loved the entertainment system! Did lots of skiing and eating! Looking forward to another trip next year! Came to ski - watch movies and tobogan. It was great! Had lots of fun! on TV and DVD. Skiing was excellent with 15" of snow in 4 days!!!! Thoroughly enjoyed your Home Theatre and your decorating. Comfortable home with much much charm. - Fav moment - Breakfast and playing Rummy on the lovely deck. In all - we had a great start to our trip - and enjoyed everything. privacy, the birds singing in the morning. It felt like I was at home - even though I was miles away. home, I usually don't have enough time to watch movies or relax. boy! (top left hand book shelf). It was a very enjoyable vacation spot. A great weekend in Vermont with great friends, great weather and a great place to stay. Went for a hike on what seemed to be the best day of the year, toured the Ben & Jerry's factory, took a short car ride to see the State Capitol and relaxed in the evening with some good takeout and games. We are now planning to do the same trip every year. What a wonderful place. Joe, Nicole, Cassie, Dave, Maggie and Jesse. best group of girls anyone could ever know! for the use of your place. stayed here in March 2004, and had a great ski week. The place is freshly decorated, the sound and movie system is easy to use, and was enjoyed by all. The pub/restaurant at the bottom of the hill was excellent for the evenings when we were too tired to cook. Leslie, the owner, answered all my questions in advance, and all the answers were correct..ie. minutes to the hill, etc. The kitchen is very well equipped from several mixing bowls to a small cooler you can use to take your lunch to the chalet. We'd come back. daughter gain skill and confidence on the slopes. comfortable setting and the view were grand. First vacation skiing with grand-daughter - What fun! Burlington. And did a LOT of reading. Great. All the amenities from home already here made the Theatre a cozy retreat and truly special. Thanks for the much needed quiet and downtime! Came for relaxation - mild days, cool evenings - perfect. the Eldelweiss, Did the leaf peeping vacation! 'Stowehof Inn" - spectacular food with a view to match. Mt Mansfield - outrageous view! the Von Trapp Family Lodge - What a perfect setting. Condo is excellent - loved Pie in the Ski Pizza too! Even saw my first shooting star. We truly enjoyed the condo - very comfortable - and the arrangement of bedrooms was perfect for our two families. Natalie (age 6) loved the bunk beds! dessert at the Trapps Austrian Tea Room - beautiful views. the Shed - it's hard to get a terrible meal in Stowe. for the nice days - you can't lose! Highlight of our stay was watching the "Theatre-sized"
and enjoying the last few hours of this peacefullness. to eat, to rent equipment - even to get groceries. PS: Great shower curtain in 1st Bathroom. suround sounds on the T.V. and enjoying your lovely town. We kept a close eye out for moose but unfortunately - no sightings! hangs from the shower head? and enjoying your lovely town. A truly wonderful place...warm and inviting. The "Theater" is awsome! Potter - which was great! back. Thank you for your warm hospitatlity! Hi Leslie and Victor, Just a note of thanks for the lovely accomodations. We thoroughly enjoyed the two weeks. The State-of-the-Art Sound System certainly enhanced our holiday. It is a holiday we will cherish for many years. We really enjoyed the deck and the swing too. All of these things contributed to a most enjoyable stay. God Bless. Deposit: Ask Rosemarie, Helen or Libby for our policies - they'll be happy to explain everything! Cancellations and Refunds: Ask Rosemarie, Helen or Libby for our policies - they'll be happy to explain everything! Required Stay: 2 day minimum at all times.